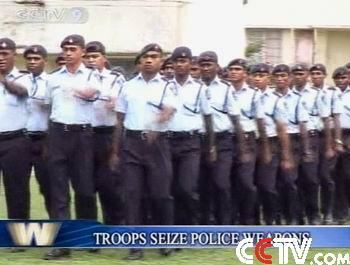 Troops have entered police armories in the South Pacific nation of Fiji and disarmed the civilian police force. The move was ordered by the leader of Fiji's armed forces, Frank Bainimarama, who's refusing to confirm if a coup is underway. Troops took weapons and ammunition away from the compound of the police tactical unit outside Suva on Monday. The unit is the Fijian police's only armed squad. Soldiers also went to an armory at the police academy in the city and removed firearms privately owned by policemen and other weapons used in official ceremonies.